Supporting communities through a sustainable system of care designed to improve the health and independence of the persons and families we serve. Decisions related to the use of resources focus on the persons we serve and family members. Systems of accountability are developed at the community level and integrated into the Center’s operations. Person-centered options are created for individuals we serve meeting common human needs for wellness, employment, homes and services in their chosen communities. Persons served by the Center and their families are actively involved in designing the system of services and supports. Partnerships are developed resulting in an innovative and integrated system of care – meeting or exceeding the expectations of the persons and communities served by the Center. We treat the persons we serve, families, our communities and each other with respect—through trauma-informed practices and culturally competent care. Our Team Members are treated with dignity and respect for their contributions to our Vision and Mission. 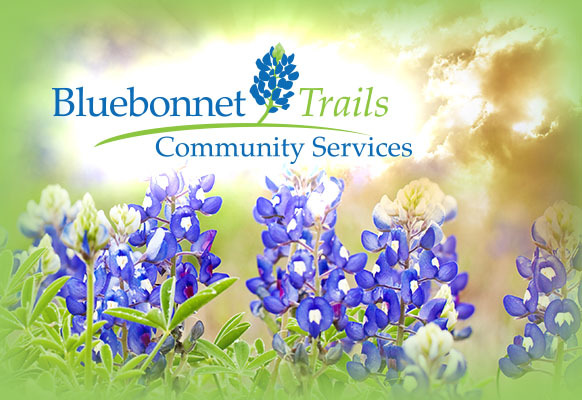 Bluebonnet Trails Community Mental Health Mental Retardation Center (the Center) was formed in 1996 through an interlocal governmental agreement among the six counties of Bastrop, Burnet, Caldwell, Fayette, Lee and Williamson. After well-attended public hearings, and at the request of these counties, the Center was legally established as a community mental health mental retardation center in 1997 by the Texas Department of Mental Health and Mental Retardation. During September 2000, Gonzales and Guadalupe Counties joined the Center establishing the current eight-county service area in which the Center is designated by the State of Texas as the local mental health and mental retardation authority. The Center is governed by a Board of Trustees appointed by the County Judges and Commissioners’ Courts from each of the eight counties. The Trustees work in responsible and accountable cooperation with local and state government and citizens of their counties to ensure the needs of the communities are heard and considered in the strategic planning and development for the Center. The members of the Board of Trustees volunteer their time, experience and talents during regular monthly meetings as well as during Center events and discussions with our community leaders. The Center is fortunate to have dedicated individuals to govern our Center in providing high quality, efficient services to persons whose lives are seriously affected by mental disorders, substance abuse disorders and developmental disabilities. Today, the Center has been renamed to Bluebonnet Trails Community Services and serves as the local mental health and mental retardation authority in eight counties with a population density of over 845,000 persons and a land mass of approximately 6,910 square miles. Center services are provided to adults with serious mental illness and chemical dependency; to children and adolescents with serious mental illness or emotional disorders, chemical dependency, autism or pervasive developmental disorders; to persons with intellectual and developmental disabilities; and to infants and toddlers with developmental delays. The Health and Human Services Commission (HHSC) annually contract with the Center to function as the mental health and intellectual and developmental disabilities authority for the counties of Bastrop, Burnet, Caldwell, Fayette, Gonzales, Guadalupe, Lee and Williamson. The authority role holds the Center accountable for ensuring access to needed services for persons meeting the eligibility criteria established by the state. Along with defining the eligibility criteria of the persons authorized to receive services, HHSC define, through their contracts with the Center, the services that may be provided. In addition to providing Mental Health and Developmental Disabilities services, the Center focuses on ensuring access to substance abuse services. The Center operates as the Outreach, Screening, Assessment and Referral (OSAR) entity in the Texas Health and Human Services Commission Region 7. As the OSAR, the Center serves thirty counties in Central Texas, including six of the eight counties in which the Center provides Mental Health and Developmental Disabilities services. The Department of State Health Services oversees the OSAR program. The goal of the OSAR program is to support prevention services and provide access to effective treatment for persons with chemical dependency. The thirty counties served by the program encompass a population density of just over 3.2 million persons and a land mass of approximately 25,500 square miles. The following counties are served by the OSAR program: Bastrop, Bell, Blanco, Brazos, Burnet, Burleson, Caldwell, Coryell, Fayette, Grimes, Hamilton, Hayes, Lampasas, Lee, Leon, Llano, Madison, Milam, Mills, Robertson, San Saba, Travis, Washington and Williamson. The Center also contracts with the Department of Assistive and Rehabilitative Services to provide early childhood intervention services (ECI) to children and the families of those children, ages 0 – 3 years, who have developmental problems. ECI services are provided in Bastrop, Burnet, Caldwell, Fayette, Lee and Williamson Counties.